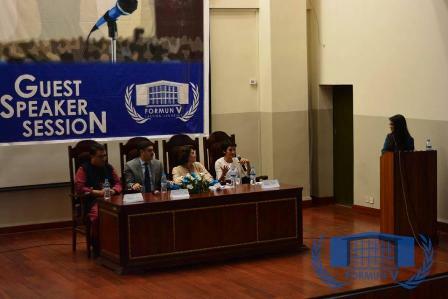 FORMUN V entertained a Guest Speakers’ Session where Haseeb Khan, Sara Belal, Anwar Ul Haq Kakar and Justice Nasira Javed Iqbal were invited. Haseeb Khan emphasized on the significance of self-actualization and finding out who you are, what you can do to contribute to the society and then strive to do it. The young and charismatic Sara Belal talked about the issues of human rights that she faces as a lawyer and, as always, made all the youth look up to her. Anwar Ul Haq Kakar, as a politician and a graduate of sociology, gave a much-needed talk about the history of his home-province, Baluchistan. In the end, the session was graced by her Lordship, retired Justice Nasira Javed Iqbal whose motherly figure and her deep concern about her homeland, adorned by Iqbal’s poetry left the audience mesmerized and in admiration of her strong spirit. The Guest Speaker Session was equally inspiring and laudable, even moving.